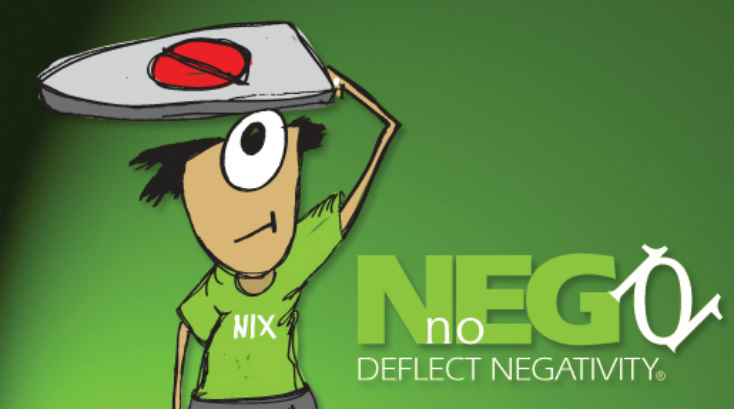 Deflecting Negativity with Nix and noNEG101 – Dreams Made Real Inc.
Deflecting negativity in our homes, jobs, churches, schools, workplace, and mainly in our minds is a hard task at times. noNEG101 is ready to help fight the battle! When negative vibes come raining down, raise your shield to deflect the negativity like noNEG Nix. Even though the Nostradamus Effect seems to be everywhere, when it searches us out we can fight the battle with a smile, a kind word, a loving touch, a positive attitude, and an enthusiastic approach to everything we do! If we are what we eat, then we definitely are what we think. And by spinning the negative into the positive (flip the positive switch), we will grow to proportions we never thought possible. A world of positive thoughts is our goal. noNEG101 encourages people to start dedicating themselves to positive thinking by deflecting negative energy in our homes, jobs, churches, schools, and mainly our minds. The Louisville-based Company introduces noNEG101 with noNEG Nix – the willowy boy with the shield deflecting negative energy all around him – a true superhero in today’s turbulent times.